The Batman-themed Nokia Lumia 900 was announced just yesterday and there were rumors we'll see its market release in a couple of weeks, but Phones4U begs to differ. The UK retailer has posted more information on the limited edition Lumia 900, announcing it's going to offer the smartphone exclusively across the United Kingdom. In fact, the phone itself is going to be super exclusive as only 900 units will ever be put into production. 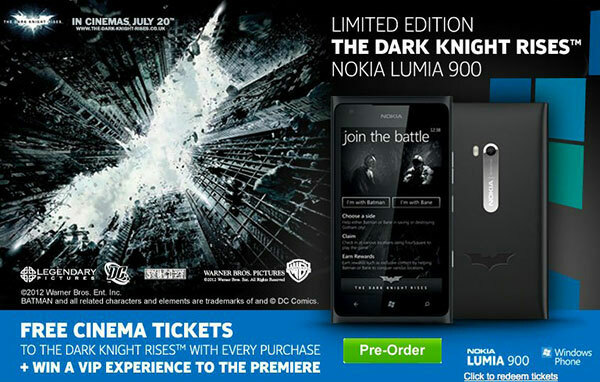 Furthermore, the Batman Lumia 900 phones will come with a Dark Knight Rises app preinstalled, which gives you access to wallpapers, ringtones and a special "Claim Gothamm City" challenge that gives you Foursquare bonuses each time you check in at the specially designated places. It is of course available on numerous contracts and plans, but if committing to a carrier long-term isn't your thing the limited edition Lumia 900 will set you back £600. As a bonus, the happy owners will receive free tickets to the Dark Knight Rises movie premiere when it hits the cinemas on July 20. Deliveries of the smartphone will start June 1st and the device is already up for pre-order, so you can already book your place in line. phone brand should do this. the way their product being used in a movie, moreover themed like the movie itself, will make movie freaks gets what they want. good job for the pushover ads Nokia.